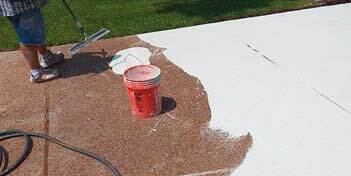 I remember reading a product catalog from a large chemical product manufacturer some years back where it loosely stated more time and money should be spent on surface preparation than on the actual product installation. I’ve always agreed with this statement, but it leaves a lot of questions regarding where and how that time and money should be spent. Surface preparation is what I call an “umbrella” word that covers a huge variety of products and processes. While the general rules of surface preparation hold true across all products and industries, the term “surface preparation” has become generic and some of the product or system details required for a successful installation have been lost. The devil is in the details, and this is especially true when it comes to decorative applications. As with most everything decorative, there are additional factors or details that often must be considered. After all, decorative is eye candy, where the final color and appearance is as important as the long-term performance. Over the last few years, I’ve seen an increase in decorative failures because generic umbrella surface preparation techniques were used or because of a complete lack of surface preparation. So, what exactly is surface preparation? I believe it’s anything and everything done to the concrete prior to applying the coating or overlay. This includes, but is not limited to, visually inspecting the surface, cleaning, removing contamination, moisture testing, surface hardness testing, mechanical or chemical preparation, and priming. When it comes to guidelines for mechanical surface preparation for concrete applications, one organization has become the industry standard. In 1988 the International Association of Concrete Repair Specialists was formed, changing its name to the International Concrete Repair Institute (www.ICRI.org) in 1993. ICRI’s focus is repair, but the first and most critical step of any repair is surface preparation. To take the guessing game out of surface preparation, ICRI created the Concrete Surface Profile Chips, also known as ICRI CSP chips. These are a set of rubber plaques numbered 1 through 10 that show properly prepared concrete ranging from almost smooth to extremely rough. The chips, along with the accompanying booklet, establish a third-party guideline for what properly prepared concrete should look like, how to achieve the desired level of surface preparation, and which profile is best for a particular overlay or coating system. Most producers of overlays and coatings for concrete use the ICRI CSP system as a guide for the recommended profile for their products and systems. It’s important to note that the ICRI CSP chip system provides a range of profiles for a given overlay or coating system, not just one specific profile. This allows various methods of preparation to be used, usually depending on what is available to the installer, to achieve the desired CSP. For example, polymer-modified microtopping overlays with a thickness of 10-40 mils are considered a high-build coating by the ICRI CSP system. The range for this application is a CSP3-CSP5 which can be achieved by any of the following: grinder with polycrystalline diamond tooling, shot blasting, bush hammer or scarifier. I’ve been promoting ICRI CSP chips for decades and strongly recommend anyone in the decorative coatings or overlay industry to get a set. Regarding mechanical surface preparation, the growth of the polished concrete industry has led to an increase in the practice of using concrete polishing grinders for surface preparation. There is no problem with this practice if the correct type of tooling is used. Polishing tooling differs from surface preparation tooling. A low-number diamond tool for polishing isn’t designed to create a rough surface. In fact, it does the opposite. Clark Branum, the Ultraflor program manager with Diamatic USA, refers to this as glazing. “When the wrong diamond tooling is used, the concrete starts to glaze over and gets smooth instead of rough,” he says. The right tooling is critical when using a polishing machine for surface preparation. “Doing a Mohs surface scratch test to determine concrete hardness is an important first step to determine which type of diamond tooling to use,” Branum adds. If the concrete is hard, a softer diamond is needed, and when the concrete is soft, a harder diamond tool is needed. Understanding which tooling to use takes time and experience. Branum is also a strong advocate of the ICRI CSP chip system as a guideline for surface preparation, but he recommends using polycrystalline diamond tooling (PCDs) when doing any surface preparation work. This article focused primarily on the mechanical portion of the surface prep process. In future articles, I’ll discuss other aspects of surface preparation. No matter the size and type of projects, you should establish a set process on all projects for evaluating and preparing a concrete substrate. Although each job may not require all the previously mentioned steps, having a standard procedure and eliminating unnecessary steps is better than guessing from job to job. This is the reason even veteran pilots with thousands of flight hours still go through the same checklists on every flight. Concrete, like flying, is terribly unforgiving of any carelessness, incapacity or neglect. You may not crash and burn, but poor surface preparation can end up costing you a job or, worse, your hard-earned reputation. The decorative overlay industry has grown exponentially over the last 10 years, and so has the number of failures and problems related to overlay installations.